I just caught this scrolling through Twitter and what a lineup we have coming our way! As Ben Robinson had indicated, Startrek.com did indeed get the dibs on announcing the next set of ships which take us from The Original Series, into The Next Generation movies to Deep Space Nine, Voyager and Enterprise. Starting off with 77 we hit one that I know a few friends of mine have been begging for since the collection began; the Romulan scoutship from In the Pale Moonlight. No shocker that this was coming thanks to some crafty previews from Ben's desk over the past few months. 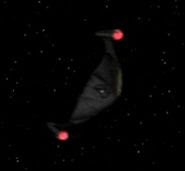 Aside from being a damn superb episode, it was the only time this Runabout size Romulan ship appeared but it made quite a big impact nevertheless. The first look pic makes it look very enticing and a must have. No question there. Also makes sense for this to be in the series rather than a shuttle pack given its relative size. Issue 78 is one we already heard about and have seen - the Voyager aeroshuttle (header pic) that did/didn't appear in the show. Another we knew was coming, it's a design that was created at the time the show aired complete with a launch sequence should it ever have been called for. It's the first time this will ever have appeared in diecast form and again looks fantastic from what we've seen. A welcome addition and could this suggest the Enterprise-D yacht could make an appearance at a later date...? 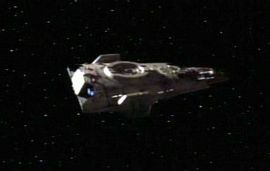 The real oddball from this new selection goes to Harry Mudd's ship, the Stella, from The Original Series. Officially it only appeared in the remastered HD episodes from a few years back but I think we can let it slide. 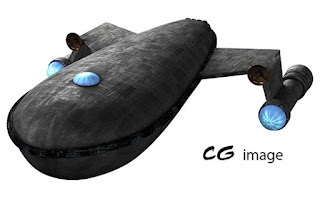 The design looks something like a slug with legs and I hope that the final version is a bit more interesting or it might get the same, loving, reaction that the Malon freighter did. Since this is only a CG render I'm not getting too hot under the collar for this one. Time will tell. Issue 80 next and one that the Starships Collection Facebook page has been clamouring for; the Federation mission scoutship (header pic) from Insurrection. Piloted by Data in one of the best sequences of the movie, this is only the second ship (after the Captain's Yacht in issue 75) to be included from the ninth movie as all the original CG was lost. The pic of the model has it with an unusual silver/metallic paint job which wasn't akin to the rest of the Starfleet ships around that time period but does keep it screen accurate. As with the Romulan shuttle/transport I'm really looking forward to getting my hands on this one purely because of its rarity. Watch this be out of stock for ages because a lot of people will be wanting this gem. Issue 81 brings back the Xindi from Enterprise's third season and it's the turn of the Reptilians this time. Wizkidz will have already put out their miniature version of this craft for Attack Wing but as for detail this will be the one setting the standard. Big expectations for this one because it's from the prequel series and we know how amazing these have been when they arrive. I've been impressed with the Xindi ships overall but will this be better than the Insectoid Fighter? Very wide stand on this one too so stability could be fun and not one that will be desired by everybody. We remain with Enterprise for issue 82 and the Warp Delta. The craft spotted being flown by young Jonathan Archer in Broken Bow, it's one of the few Earth ships that graced the screen during the show's four seasons. Again given the brilliance of the models from the show I know now that this is going to be a winner even if we don't have any official pics of the Eaglemoss model to go by at this time. Not a model that I've been dying to get hold of - I'd actually forgotten about it - but certainly one that completes the evolution of Starfleet craft. 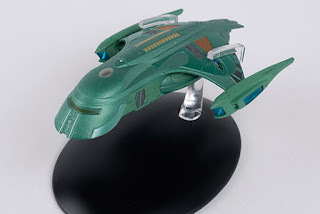 Finally and perhaps unexpectedly we have a third Bajoran craft following the Solar Sailor (issue 18) and the Bajoran Sub-Impulse Raider (issue 74) in the shape of the Troop Transport. Seen first off in In the Hands of the Prophets it's dropped in and out of the show thanks to the use of stock footage. Again Wizkidz were ahead of the game with their small version but I would like to think this will be a vast improvement over that piece even if I do think it looks like an oversized door wedge. Good to see that Deep Space Nine has two entries in this list as it has been conspicuous through its sporadic entries to the collection. So there we have it. 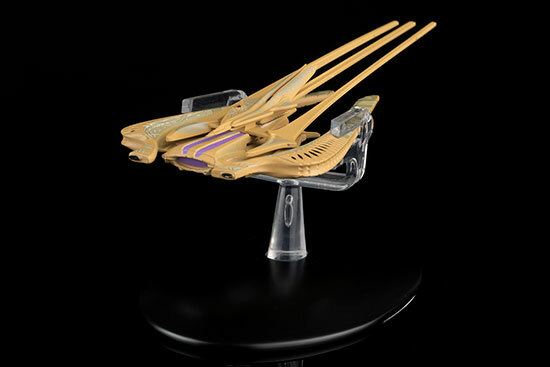 Still no sign of Kazon, Vidiian, Son'a or the Scimitar among the latest announced issues but the inclusion of that scoutship does tell us that all is not lost when it comes to the non-existent CG craft from Insurrection or Nemesis. Further for note, all of these craft are available in CG to start with! 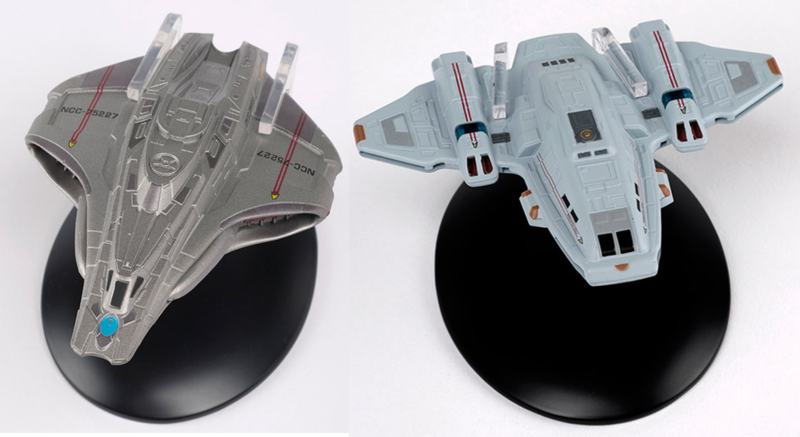 We still await a date for the Mirror Universe NX-01 and the (probably much later) second shuttle set but for now this is a decent round of newbies with a highlight for everyone whatever your show of choice and political leaning! What are your thoughts on these seven ship announcements? Which are must haves and what might you avoid? Let me know below! You can also check out every starship review since issue one with the SKoST Collection archive!